Please also read description for CE970 as this is a two part kit. 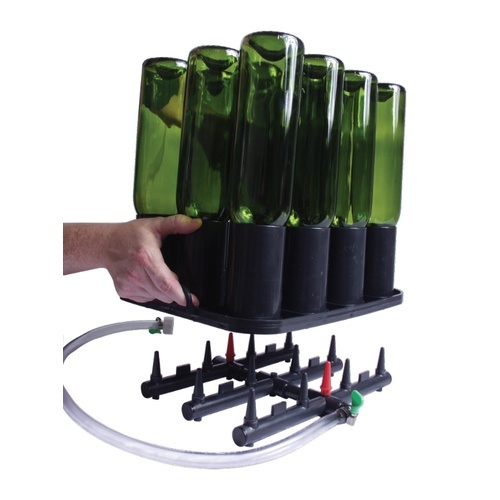 Holds 12 bottles upside down at one time. Load bottles out of the cardboard boxes they come in and into these plastic racks. These racks then sit down on a base used to either rinse or gas flush the bottles, depending on what you have hooked up to the base (water or inert gas.) You will defintely want more racks than bases. Swing top bottles will fit if wire swing top is removed. I wanted a better way to carry slippery bottles. To complement bottle rinsing base. 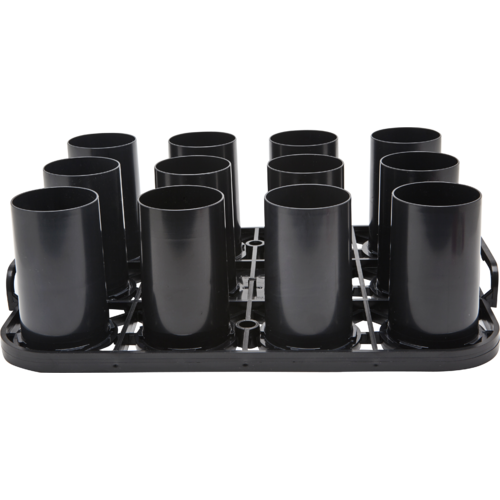 Together with the MoreWine supplied base (and an in-line sterilizing fluid injector available from other sources), these racks make a great bottle rinsing system that can be connected via standard hose connection to your hot water source. With the system described (I use Sani-Clean as the sterilization agent) you can rinse and sterilize a case of bottles (12) quickly and easily. Leave the bottles in the rack until drained and dry (a few hours) and they will then be ready for filling. I have enough racks to handle the number of cases I wish to bottle each day. This works great for me. 12-24 oz bottles load easily and are held upright. Bottles are easily removed from the rack so I can place them on my bottle tree to dry. Perfect for what we are using! 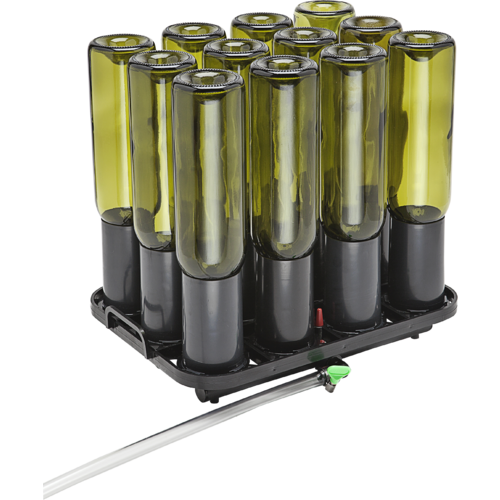 these are awesome if you are doing semi-automatic bottling. I use eight of them and keep the bottle filler and corker humming. This works fine, but, in an attempt to speed up the process, I would like this set up to fit the bottles in the case. I would like to be able to set this on top of the bottles in the case, then flip the case over and have it loaded and ready. Currently have to hand load it 2 bottles at a time. Other then that...No issues, works fine. So far I am quite pleased with the performance of this product. While I only started messing around with it today, it seems to hold a wide variety of bottles quite nicely. Since I use everything from 12 oz. bottles to European champagne bottles, I was concerned it would not work with my entire collection, but the spacing and adaptability of the unit seems to have taken all of this into account. Belgian-style bottles and the Euro-champagne bottles do take a bit of force to push into the holding prongs, so with time I suppose this "could" cause enough fatigue with the plastic parts and cause breakage....but only time will tell. So far, I like this product! Note: the greater issue is with the associated rinser/purger base (CE970).